Through our PTV Academy we offer our staff a wide range of in-house training courses which cover two main areas. On the one hand, we want to encourage and strengthen our staff’s soft skills. So there are specific training courses that help our employees improve their presentation and facilitation skills. On the other hand, we attach great importance to the personal and professional development of our personnel. With this in mind, we custom design training programmes that meet the specific needs of our staff. Individual or group coaching and team workshops complement our talent enhancement programme. Apart from our in-house training courses, our employees also have the opportunity to attend external training programmes, workshops and conferences. The aim is to encourage exchange of experiences and good practices with other experts in various fields. Various in-house language courses start several times a year. They help our employees improve their German or English language skills, for example. 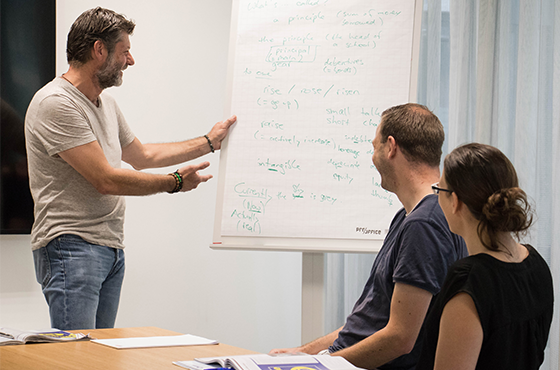 The language courses take place in small groups of four to eight people – at both our headquarters in Karlsruhe and our branch offices. There are also specific training programmes for different target groups within our company. Junior managers can for example attend a personnel development programme over a period of several months. This course consists of several modules that help them prepare for their new role.